Whether you’re a man or woman or whether you shave daily or every few days, you'll need a quality product like Barbasol shaving cream. Shaving can be a lot of work, and the longer you do it, the more likely you are to experience skin irritation, burns, cuts, or nasty rashes. Shaving creams act as a protective barrier between the blade and skin as they allow the blade to glide freely on the skin, cutting all hair follicles while leaving the skin intact. What Is Barbasol Shaving Cream? Finding the right shaving cream matters because it comes in direct contact with your skin. The skin is the human body's largest and most absorbing organ, meaning that whatever you put on the skin enters your system, affecting it positively or negatively. Just like when choosing food, you don’t want to use a shaving cream that contains ingredients you may be allergic to or that are toxic. Also, depending on your skin type, some shaving cream formulas may either help or hinder the skin. Read the ingredients on the shaving creams you plan to buy to see if there are factors that you know your skin is sensitive to. This means you should not just buy any drugstore brand; find the one that will nourish and protect your skin. With an endless variety of shaving creams and gels out there, it can be a headache sifting through them to discover the one that’s just right for you. 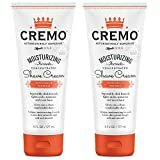 It helps to identify the key features a shaving cream must have for your skin type and the features that are instant deal breakers. In this article, we'll be pointing out the features that make a worthwhile shaving cream, and those that don’t. We’ll review four popular brands, with an emphasis on Barbasol shaving cream, and evaluate what makes them the preferred choice of many buyers. In reviewing these shaving creams, we’ll highlight the key ingredients behind their successful formulas, concluding with a verdict on what we think is the top product to give a try. Barbasol shaving cream is America’s favorite and has been around for almost 100 years. In business since 1919, Barbasol has been making the shaving process easier for milions of men and women. Packaged in an aluminum aerosol can, the product immediately comes out as a foam, making it easy to apply to the skin. There’s no working up a lather; just apply it with your hands or a shaving brush on wet skin and shave. Barbasol shaving cream allows any blade to glide seamlessly on the skin, cutting and grabbing facial hair in its path, even the toughest ones. It’s a thick and creamy lather that lubricates facial hair and conditions the skin. Even overgrown hair is no match to this cream. With frequent use, you’ll notice improvements in your skin's appearance. Barbasol is ideal for all skin types because it is free of preservatives and common allergens, such as gluten and soy. Before use, wash your face with warm water and keep it wet. Shake the can and hold it upright, pressing the top to release the lather. Apply the cream to your face, shave, and rinse thoroughly. The result is a silky smooth skin with little to no irritation from the blade, and a close shave only a barber could pull off so perfectly. We picked a few similar products to Barbasol to see how they compare. Priced at around $10.00 for a 10-ounce can. This product is already a creamy foam right out of the can. The specific scent is unknown but some consumers say Barbasol Original has a mild earthy scent that quickly fades away. This is a 10-ounce aerosol aluminum can with white, orange, and dark blue labeling, containing the brand’s name on the front and a dark blue cap. The full Ingredient list of Barbasol shaving cream is water, stearic acid, triethanolamine, isobutene, laureth-23, sodium lauryl sulfate, propane, and fragrance. 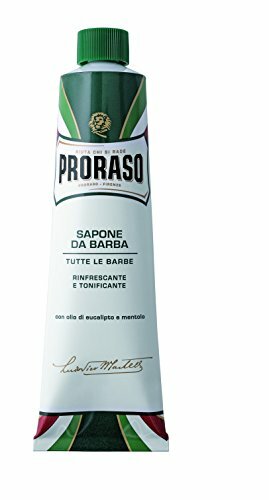 This shaving cream has been barbers’ top choice in Italy since 1948 when it was introduced into the market. 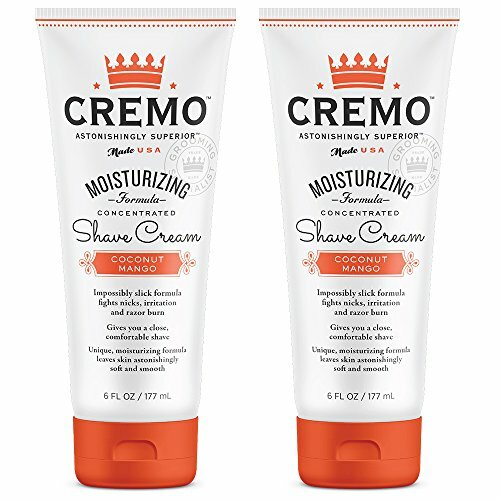 Created in Italy, it’s a popular stearin-based shaving cream especially in the Mediterranean country. It’s best known for its natural ingredients, like botanical and natural oils which help protect the skin during the entire shaving process. It contains no silicons, mineral oils, sodium laurel sulfate, artificial colors, or parabens. With just a dime size amount and water, you can work up a thick, rich lather that’s refreshing and toning. This cream allows the blade to glide smoothly on the skin, causing fewer nicks, cuts, burns, and rashes than big brand products do. The result is skin that’s soft, hydrated, and irritation-free. To use, get your skin slightly wet and work up a lather with water. When the product is creamy, apply it to your skin and shave. Rinse afterward. Priced at around $10.00 for 5.3 ounces. The product produces a thick, creamy, soft, and elastic lather with just a little water worked into it. The menthol scent is not too overpowering. The product comes in an aluminum foil tube that’s like a toothpaste container. The tube is green and white with red on it. It has the brand name on the front. The tube is about 8 inches long. The key ingredients of this shaving cream are glycerin, which provides the effortless glide, and eucalyptus oil, which improves the condition of the skin and makes it easier to shave if you already have rashes and razor burns. This oil also cleanses facial hair and skin. The product also contains menthol which refreshes and revitalizes, waking you up and making the skin feel cool and nice. This is a women’s shaving cream that has a natural concentrated formula. It gives you the right amount in just an almond-sized squeeze. What makes this product unique is that it contains slick molecules that allow the razor to glide easily over the skin, leaving it feeling smooth. You can even shave against the grain with no problem. With water, these ingredients become slick, reducing the likelihood of nicks and irritation. The result is a close shave and a baby smooth skin. This cream is perfect for women with sensitive skin, thanks to its ingredients like calendula and papaya extract, but also a good choice for men with sensitive skin. Before use, rub your skin with the hot water for 30 seconds or use a hot towel. While your skin is still wet, apply an almond size amount of the product on to it. Add a few drops of water to keep the cream slippery, and shave with any blade. The 2-pack of 2 x 6.4 ounces sells for around $10 on Amazon.com. A single bottle should last around 90 days with daily use. The product lathers quickly once activated with water. Relaxing, sweet, and tropical scent. White plastic tube and an orange pop up cap with the brand’s name on the front of the tube. This product is natural and paraben-free. The key ingredients are macadamia seed oil, water, aloe, calendula extract, lemon extract, papaya extract, and olive leaf extract. This shaving cream can be used on any body region you want to shave. 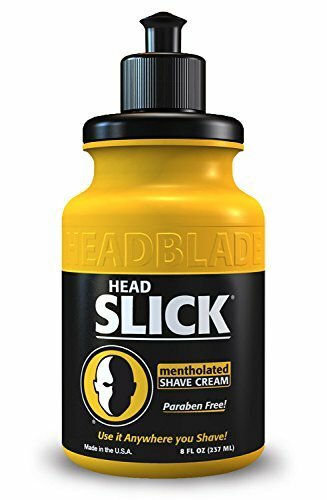 Designed for full-head shaving, this cream is water soluble, so blades are easy to rinse clean after use. What makes this product tremendously popular is that it’s highly lubricating, which allows the blade to glide freely on the skin surface. The result is a cool fresh feeling both during and after shaving. To use, get your skin wet and clean, apply a quarter amount in your hand and rub it in circular motions on your skin. Don’t rinse until you're done shaving. Priced at around $13.00 for 8 ounces. The product doesn't produce a thick lather. Dark yellow plastic bottle with black labeling and a black cap. The brand’s name is molded onto the bottle and printed on the front-of-pack label. The bottle is approximately 5.8 inches and is packaged in a deep yellow and black paper box. The key ingredient is menthol. Other ingredients are water, myristic acid, potassium hydroxide, propylene glycol, and cetearyl alcohol. Don’t skimp on your shaving cream. Using the wrong product over time can lead to irritated and damaged skin. It can even compromise your overall health when you consider the potential toxicity of ingredients. Instead of going with what’s familiar or what’s within reach, understand your skin type's needs and the ingredients and formulations that meet those need. You want a comfortable shaving experience that results in a smooth close shave. One of the biggest things to consider in a shaving cream is its application. No matter what your skin condition is, you want a cream or gel that allows the blade to glide effortlessly on the skin. That way, you’ll minimize cuts, scrapes, and rashes. You'll also want to consider how the product makes your skin feel after shaving. You definitely want your skin to feel soft and comfortable, not dry and tight. The scent is another consideration. If you purchase scented product, make sure it's from an essential oil and steer clear from toxic synthetic chemicals. Out of all the shaving creams we reviewed, we chose the one we felt out-performed the rest. With a total rating of 4 stars out of 5, we believe Barbasol shaving cream is fairly affordable for the amount you get. Also, there’s no effort in working up a lather, and with its mild scent, even those who are sensitive to perfumes can use it. We also appreciate how the container is easy to work with. With just a simple push, you get a creamy lather ready to apply. Also, we especially love how the aluminum container doesn’t rust. Most importantly, with just eight ingredients, you get what you need to have a comfortable shave and nothing else. Since it lacks all the major allergens and toxic ingredients found in conventional skin care products, Barbasol shaving cream is something you can feel good about using inside and out.